A special commemorative flypast marking the 75th anniversary of the Battle of Britain will be among the highlights of next summer’s Royal International Air Tattoo at RAF Fairford. The details were announced as specially-priced tickets for the three–day airshow, which takes place on July 17-19, went on sale for a limited period. Super Earlybird admission tickets, priced at £26 for the Friday and £36 for Saturday and Sunday are available until January 31, 2015. The prices represent a saving of more than 20 per cent off the cost of a standard admission ticket. Next summer’s airshow will focus on aircraft from around the world whose primary role is to protect their nations’ skies whether in support of combat missions, intelligence gathering, providing an airlift capability or delivering humanitarian aid. Themed ‘Securing The Skies – Past, Present, Future’, the airshow will look to feature legendary aircraft such as the Spitfire and Hurricane, that proved so effective during World War Two; operational aircraft such as the RAF Tornado, currently in action over Iraq; and the RAF Typhoon, which remain on 24-hour standby in the UK and were scrambled recently to intercept Russian bombers. The Air Tattoo also hopes that the futuristic Lockheed Martin F-35 Lightning II, which was due to take part in the 2014 airshow, will make its much heralded European display debut at RAF Fairford next summer. Air Tattoo Chief Executive Andy Armstrong said that with so much instability in the world, it was the ideal time to turn the spotlight on the important role air power has played and continues to play in making Britain and our allies around the world, safer. 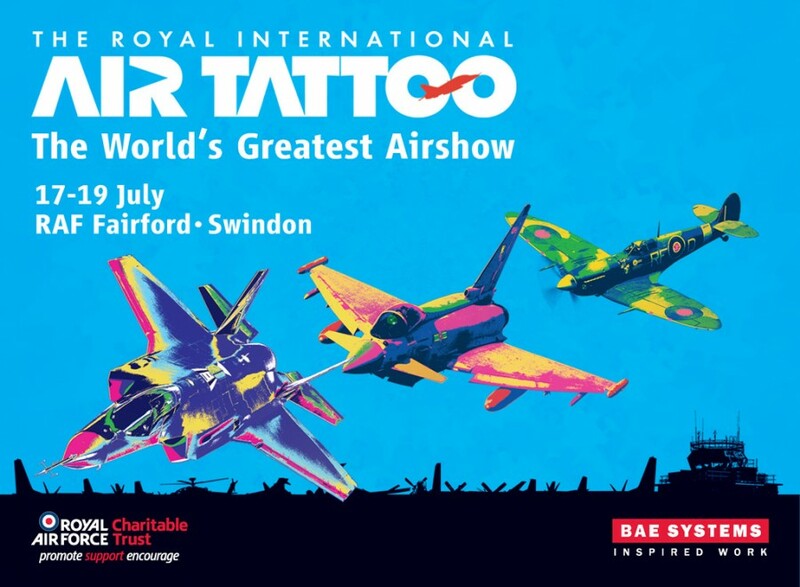 The Royal International Air Tattoo is staged annually at RAF Fairford in support of the RAF Charitable Trust. To purchase Super Earlybird admission tickets and to view enclosure options, visit airtattoo.com. All under-16s go free. Free parking. PreviousAIRSHOW NEWS: RAFA Shoreham Airshow wins ‘Best Community Event Award’ for the 2014 Event!